Christmas is a magical time, where families come together to celebrate their love for each other, give gifts, eat loads of food and have a generally wonderful time. But after Christmas is over, there’s a tree to dispose of, there may be playrooms overflowing with new and old toys, and the bins may be struggling to hold all the waste after the party season. So, it can be very tempting, particularly when it comes to getting rid of bigger waste like your tree, to employ a cheap man with a van you find on social media to come take your rubbish away, giving you that fresh start for the New Year in a clean home. But you need to be careful, as more and more unlicensed people are taking to social media to offer these kinds of services, and then simply dumping the rubbish where they see fit, rather than at a proper landfill site. They’re taking your money and then committing a crime. And what’s worse is that, if the rubbish is traceable back to you, then you’ll be the one hit with a large fine. Thankfully for you and for local councils who want to keep the area clean, we offer a service where we can monitor fly tipping hotspots and identify those who are dumping waste illegally. We can gather enough evidence to prosecute them, in order to stop this becoming a recurring problem. However, be careful over the festive season, and don’t trust any advert you see on your social media feeds. Always make sure you ask a licensed removal person to take your waste away. 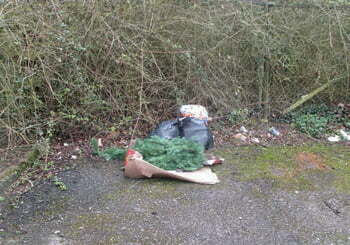 And if you’re a council needing our support to put an end to fly tipping, you can call us on 01772 334700. Merry Christmas from the team at EJM Investigations!